I think today’s home tour just might be the perfect blend for both the husband and wife. If you watch those house hunting shows on T.V., you’ve probably noticed the man typically defers to the wife’s desires when it comes to choosing a new home. Not always, but a majority of the time. 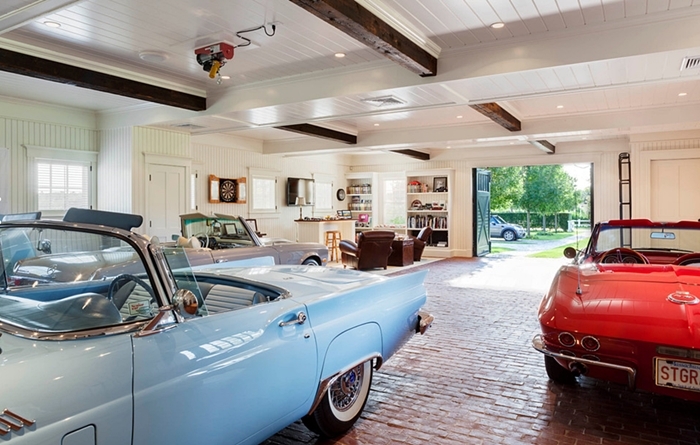 Today’s charming car barn by Patrick Ahearn Architect has something for both parties! 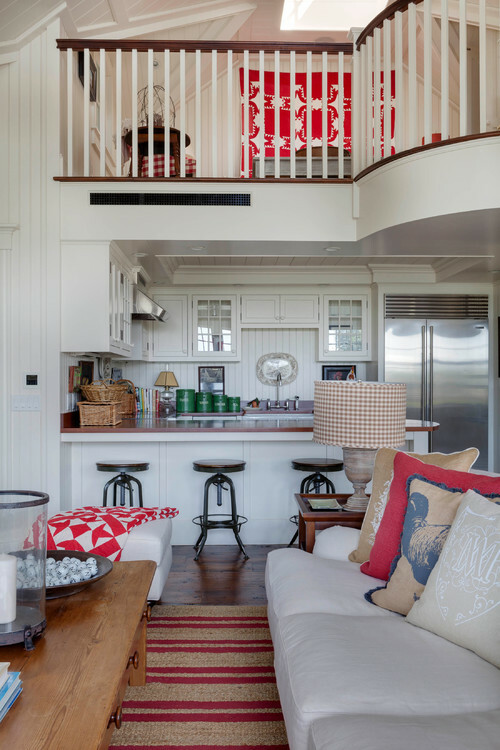 An open concept floor plan contains plenty of charm and style with accents of red and blue. 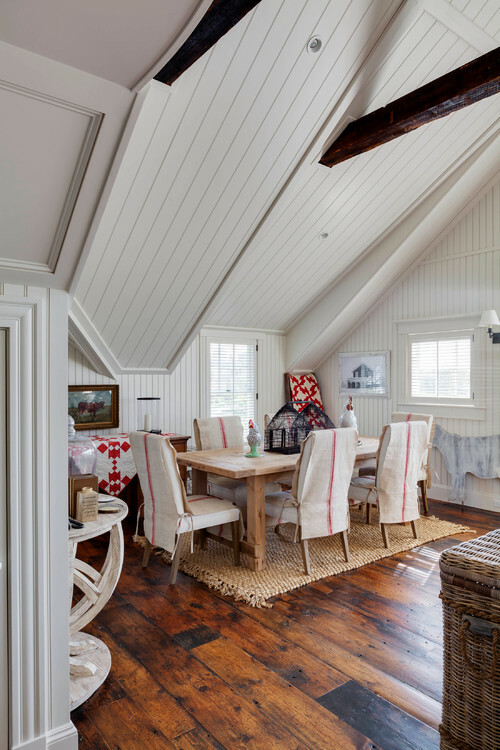 I’m a huge fan of bead board, shiplap, board and batten – really any type of architectural treatment or trim in a home. I think a great way of adding “warmth” to white spaces is to add custom elements like this living room. The rustic beams and wall of windows are an added bonus. 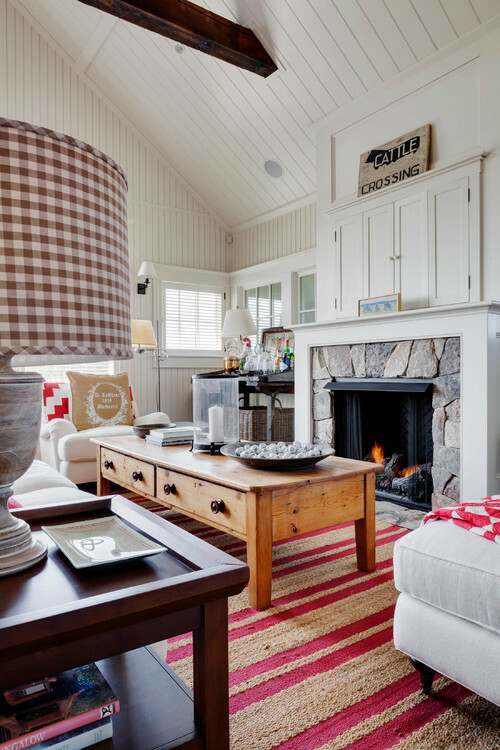 Cozy quilts, gingham checks, and a striped nubby rug add texture and visual appeal. The living room opens into the kitchen, with an airy loft overhead. The floor plan is perfect for family get-togethers or entertaining friends. Gorgeous wood floors add a rich element to the vaulted rooms. 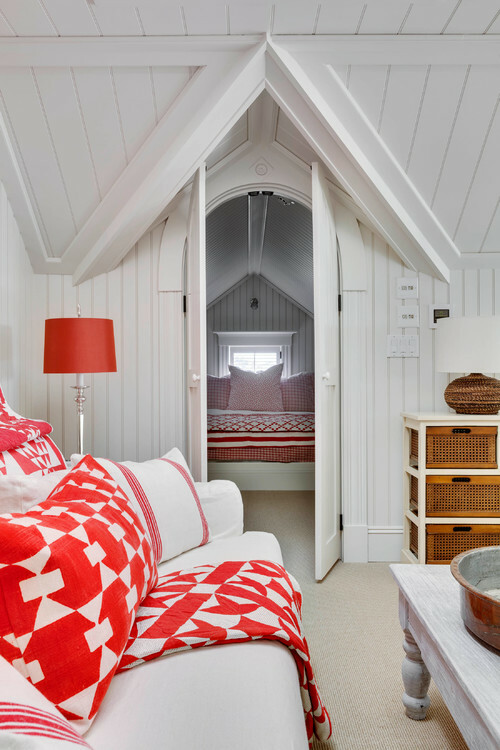 How adorable is this arched doorway to a cozy sleeping room? Pretty adorable, right? 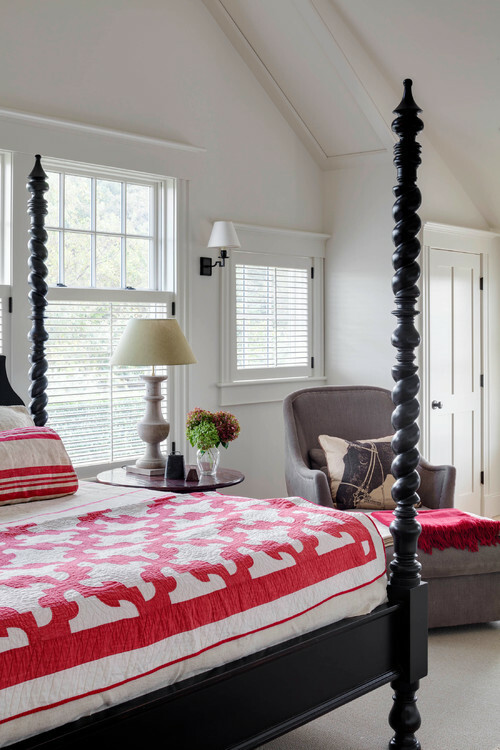 Red accentuates the master bedroom with its beautiful four-poster bed. Now comes the man cave part of the car barn! Leather recliners pair up in front of the bar to watch T.V. The brick floor and beamed ceiling put the crowning touch on this space that needs to be worthy of housing vintage vehicles. So what do you think? Does this car barn house the ultimate man cave? All I know is, I’ll take that powder blue car! My hunch is that the car barn is used as a guest house on a larger piece of property with an expansive home, but I’d be happy to live there year-round. 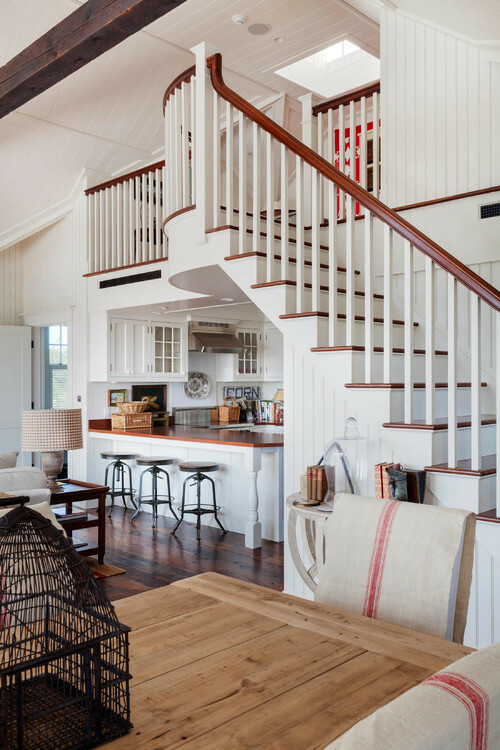 You can see more of Patrick Ahearn’s charming car barn over at Houzz. 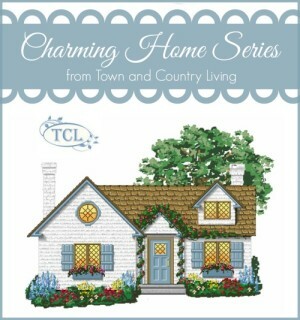 Tour more houses in the Charming Home Series! What a great house! I love the car barn as well. This is a fabulous place all around! Yeah, the ’57 Thunderbird would be a fun car to drive. I pinned this to a newly created Pinterest board called Home Tours. I’m with you. I think this is not only space for the cars, but guest quarters to a much larger home. Yikes – definitely how the “other half” lives. Am in love with that house,except to have to clean. Give me our little single wide at this point in life, have better things to do with my energy/.time than cleaning a big house,lol..So I’m lazy at 77. Saw so much I really loved. Very very nice. I love it and I will take that blue car too! A T-Bird? This Car Barn house is a total reflection of a husband wife’s team work. Quite a good choice of furniture and the color combinations all are visible in the pictures. Good team work I must say. The flooring and roofing are two key elements, I love the most. Totally in love with the house and especially the Car Bar is surely a new place to for guest visits.